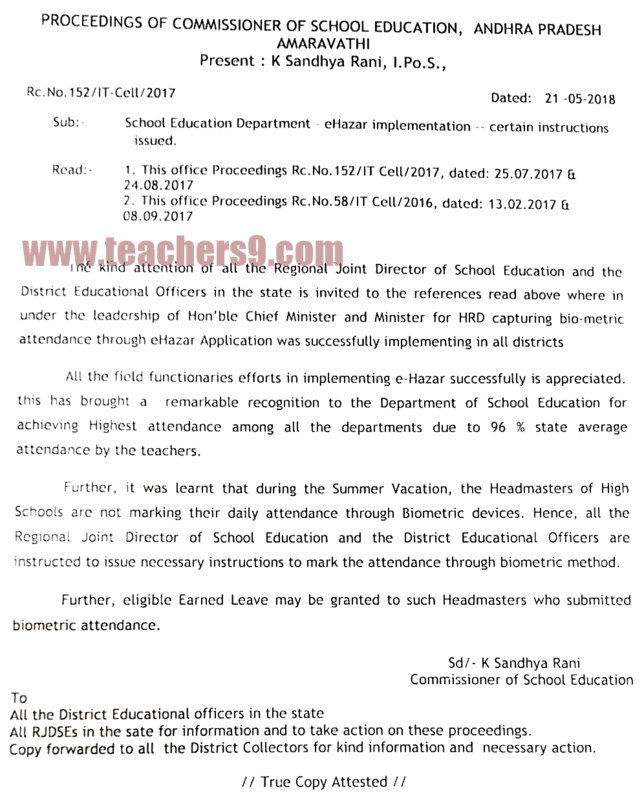 Sub : School Education Department - e Hazar implementation - certain instructions issued. All the field functionaries efforts in implementing e-Hazar successfully is appreciated. thus has brought a remarkable recognition to the Department of School Education for achieving Highest attendance among all the departments due to 96 % state average attendance by the teachers. Further, it was learnt that during the Summer Vacation, the Headmasters of High Schools are not marking their daily attendance through Biometric devices. Hence, all the Regional Joint Director of School Education and the District Educational Officers are instructed to issue necessary instructions to mark the attendance through biometric method. Further, eligible Earned Leave may be granted to such Headmasters who submitted bio metric attendance.